Location Syria. Green pin on the map. Yesterday, the military media of Syria’s allied forces published aerial photographs showing crowds inside Jordanian territory. A clear message that what you are doing is under the range of sight and fire. Syrian Foreign Minister Walid al-Moallem said yesterday that “the priority of the desert” is in the field battles. He pointed out at a press conference that reaching Deir al-Zour is “the main direction and objective.” The desert, whether it is south towards the border with Jordan, or in the middle of the desert towards Sokhna or perhaps the border with Iraq. As for the activity of the coalition forces and its wild arms in that area, and the possibility that this would lead to a clash with the Syrian army, al-Moallem said that “if the US target was to attack the Syrian army, it is natural to defend ourselves”. The de-escalation agreement for four fighting zones in Syria has come into effect. The battles between Syrian government forces (red) and the foreign-supported “rebels” (yellow) has ebbed in the north, in Idlib and north Hama, in the south around Deraa, around the besieged “rebel” enclaves north of Homs and east of Damascus in east-Ghouta. That does not mean that those areas are peaceful or safe. In the north Turkey is skirmishing with U.S. supported Kurds (purple), in Deraa governate ISIS is infighting with other Jihadi “rebels” and in east-Ghouta various “rebel” groups are trying to eliminate each other. This de-escalation has freed up Syrian government forces which are now repositioning for a large attack on southeast Syria towards Deir-Ezzor and the Iraqi border. One axis of the attack will be from the capital to the east along the Damascus-Baghdad highway towards the Iraqi border. Another one will aim from Palmyra east through Sukhnah towards Deir Ezzor. (Roughly painted as red arrows on the map). This terrain in-between is largely desert with only a few villages and some oil installations on the way. Large distances can be covered within a few hours. Fighting against ISIS (aka the Islamic State, gray) will be limited to the few build up areas. But the long “lines of communication”, i.e. the supply roads, will be in constant danger of raids from roving ISIS militants and possibly U.S. airplanes. In parallel to the two large attacks smaller operations (sketched as green arrows on the map) will proceed to eliminate ISIS and “rebel” forces near the government-held western heartland. The current U.S.-Kurdish operation against ISIS in Raqqa is pushing ISIS elements towards those western government areas. The (green) “secure the realms” operations are designed to surround and eliminate all enemy areas to the west of the line and to prevent further infiltration into core areas. 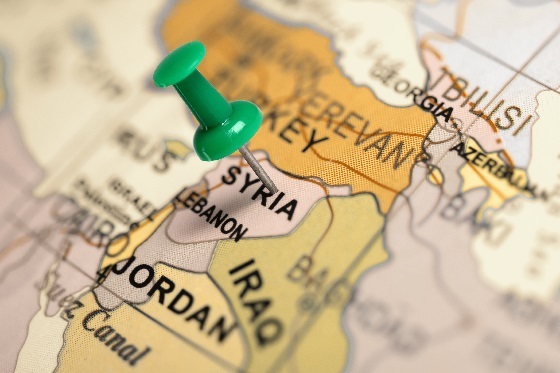 It would be quite risky for Jordan to take part or even allow such a large military operation in Syria. ISIS has infiltrated refugee camps in and near Jordan and has a substantial following within the country. But Jordan depends on U.S. and Gulf country money and can only reject their demands to a certain degree. 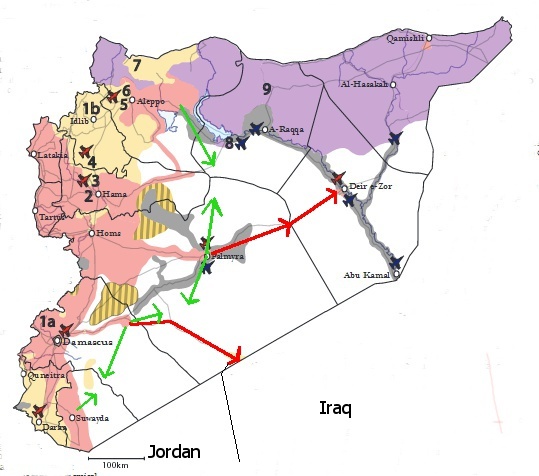 Should the U.S. military decide to take all of the east-Syria by moving in from Jordan it will come into conflict with the Syrian (red arrow) forces pushing east. These Syrian movements will be accompanied by Russian military elements. Any collision of these maneuver groups could lead to serious escalations. I doubt that U.S. President Trump has a personal interest in any move in Syria beyond the taking of Raqqa, He needs that success together with the taking of Mosul in Iraq from ISIS for propaganda purposes. Taking Raqqa will be difficult enough. The U.S.-Kurdish forces are still skirmishing ISIS around Taqba city and its dam, (some 30 kilometers from Raqqa) and the Kurds want further political concessions before moving on. Any additional “nation building” will hamper Trump’s other political aims. The military hawks in his government and in the Gulf countries led by Saudi Arabia are aiming further. It is now the National Security Advisor General McMaster who is pushing for regime change in Syria. The recent U.S. cruise missile attack on the Syrian Shayrat air base which was predominantly used to fight ISIS was McMaster’s plan. But it seems that McMaster is now disliked by Trump and the inner White House circles. There is some hope that he will leave soon. The Syrian Foreign Minister already detects some change in the U.S. attitude towards the situation in Syria. The plans of the Syrian government and its allies make sense. But the large moves towards the east can only proceed if the de-escalation schemes in the west keep the battlefields there relatively quiet. This again depends on Turkey’s willingness to blockade new weapon flows towards the “rebels” and al-Qaeda especially in north Syria. The Turkish President Erdogan is known for turning on a dime. The Gulf countries will offer him huge bribes to spoil the de-escalation. Russia is offering a pipeline which promises long term profits. It is hard to know which bribe he will prefer and which side he will -in the end- decide to support. A senior U.S. official says the Trump administration has approved providing heavier weapons to Syria’s Kurds as they move closer to the key Islamic State stronghold of Raqqa. The decision comes despite sharp objections from Turkey. Turkey is (rightly) fearing that one day these weapons will be used against it.